When your kids are teenagers, buying them presents can feel like a minefield. They’ll like something one day but the next, it’s not cool anymore and they won’t want it. 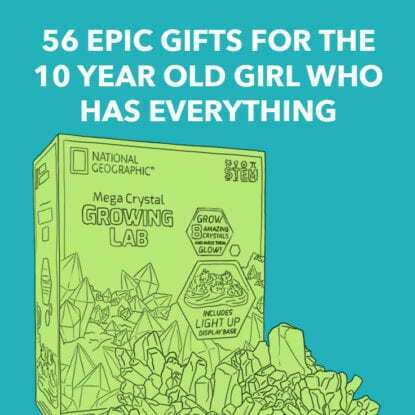 Take a look at our list of gifts for teens who have everything and see if there’s something in here which you know they’ll love. 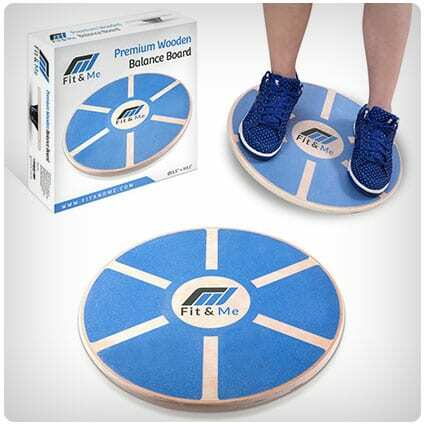 Perfect for both athletes and those who just want to get in shape, this wooden wobble board will improve core strength and stability as well as balance. It also comes with a video, showing you how to get the most out of your new board. These Ray-Bans will finish off any outfit, whether you give them to your son or daughter. The metal frame is sturdy and the lenses it holds are a crystal green, giving them an edge over the usual brown or black ones you can get in the store. This is an ideal gift for teens who love books and reading. With its unique leather book design, they’ll be able to fit their laptop or maybe a couple of books inside and everyone will be asking them where they got their awesome bag from. Vinyls are making a comeback and as we know, you need a decent turntable to play them on. This one can play 7”, 10” and 12” records and its USB port allows it to be connected to PCs and Macs. It’ll be a great excuse to get all your old vinyls out. An important part of keeping fit is remembering to stay hydrated, however, keeping track of your daily intake can be difficult. This smart water bottle connects with your smartphone to do it for you – it’ll glow when you need to have some water, making it almost impossible for you to forget. When travelling, you want to pack light, and bringing your whole makeup bag along isn’t practical, especially when it’s overflowing with beauty products. This travel bag will make it easy for you to put the essentials in, closes using the drawstring, and keeps your products safe. You never know when you’ll need this emergency blanket. Keep it in the trunk of your car in case you break down, or bring it along on your next camping trip to save lugging around a bulky sleeping bag. Wherever you use it, it’s sure to keep you toasty. Who said slingshots were just for children? This one has been given a grown-up makeover, making it perfect for teenagers and adults alike. Handmade and finished with a walnut stain, you can use it to go hunting or just to play around with your friends. Safety first, though! Some of us just love learning new things. If your teenager is like that, they’ll love this motorized solar system. It can turn any room into a planetarium, allowing you to learn more and more about space and the teeny piece of it we call home. Do you remember those weekends you spent at the arcade, playing on the different games? Show your teen how much fun can be had in simple games with this build your own pinball kit. It contains everything you need to create a functioning pinball machine. Purr-fect for your feline loving teen, this sterling silver ring is absolutely adorable. It has 2 cat ears on the top which will be visible to everyone else but on the inside, there’s tiny imprinted pawprints, looking like you’re being cuddled by a real cat. Are you fed up of telling your teen to tidy up their wires on their desk? A tidy desk space makes for a tidy mind and that’s where this little accessory comes in handy. They’ll be able to keep every wire looking neat as multiple cables can stack on top of each other. Lush products not only smell good and do their job well, they’re also completely ethical and eco-friendly too. Their Dirty Body spray is filled with a blend of spearmint, sandalwood and other essential oils which come together to create a masculine scent. The ideal gift for teens who loves to learn, these knee high socks fit a woman’s size 5-10. The black background is covered with white workings out of equations, and Einstein’s face is near the top. The purple heel and toe give them a little bit of color as well which is always a bonus. If your teenager is a fan of the video game series Zelda, this shield would make a brilliant gift. It’s a full size replica of the shield Link obtains during his quest to rescue Zelda. It can be mounted on the wall or even used in recreations of the adventures Link has in Hyrule. When our children grow up, we hope that we’ve equipped them with enough knowledge to make it in the world without us by their side. But there are some things we just don’t know, and if surviving in the wilderness is one of those things, your teen will really appreciate this book. Help them capture important memories of their senior year with this Fujifilm Instax camera. It’ll produce instant photos which they will be able to give out to their friends, or pin to their bedroom wall. It also has a selfie mode which is perfect for teens these days. This cute little cap would finish off any outfit. It’s black which we all know goes with everything, but it has a difference – embroided on the front in white thread, there’s a cat nose and whiskers and perched on the top, there’s two black cat ears. Add some rainbow color to your outfit and no one need know. Hidden under your trousers, these lilac socks with a unicorn making a rainbow will make your feel magical. Or you could put them on show and let everyone see how awesome your taste in socks are. These coloring pencils from Primacolor promise to have highly saturated pigments and are perfect for shading or adding shadows. The lead inside is also strong enough to withstand heavy coloring, and won’t chip or crack. Inside this pack, there are 48 pencils of different colors, and they would make great gifts for any artists, young or old. As we get older, we wish we could go back in time and give our teenage self some words of wisdom. With this “Letters To My Future Self” pack, your teenager will be able to write to his adult self, explaining how things are going, how he’s feeling and what his hopes for the future are. Iron-on patches are making a comeback, and now your teen can show off their love for NASA with this red and white one. It can be added to most clothing garments such as jackets, caps and even backpacks to give it that nerdy chic feel. Excellent gifts for teens, these slippers will be a hit with your daughter as not only are they in the shape of a unicorn…they also light up! The pastel rainbow mane and tail with the blue LED light up cheeks make these the cutest slippers around. Who doesn’t love a taco? Your teenager can now carry around their lunch in this amazing taco truck lunch tote. Bright yellow and with amazing detailing, they’ll never lose their lunch again. The EVA lining will keep their food cool, and the bag itself is durable and crush resistant. Perfect for travelling light, this camping hammock can be used in a variety of settings and even comes with a mosquito net which it can be used with or without. It’s strong and durable, meaning it can withstand all kinds of weather and environments. During senior year, our teenagers make so many memories and they want to capture them all. But finding somewhere to display the photos isn’t easy. With this Hangit photo frame, they’ll be able to have them how they want and rearrange as and when they feel like it. When our teenagers leave home, we worry that they’re not going to be able to manage, especially when it comes to their laundry. If they have a disaster at their house, they’ll need this wet suit packing bag to bring their damp clothes to your house so you can save the day. Selfies are the new way to take photos these days and our young adults spend hours trying to get the perfect shot. Why let all that effort go to waste without displaying their photos? This album is an excellent way for them to store all their pictures of themselves. Looking good is top of the priority list for teens. This hair mask will help their mane look shiny and healthy, without them having to put much effort in at all. Its 3 in 1 step treatment will work quickly and easily, so they can fit it in around their busy lives. If you’re looking for a house warming present for your teen who has just left home, this Death Star toaster is a must for your Star Wars loving teenager. Not only does it look good, it also puts a Tie Fighter mark onto their toast. Whether they use them for doing their homework on their computer or for listening to their favorite music, these headphones will be the best pair they’ve owned. The headband stretches so they can fit any head shape and they also fold down, making them easy to transport. Vegan or carnivore, avocados go with everything and they’ve become quite popular in recent years for their superfood ability. Show off your love for this amazing fruit (yep, it’s technically a fruit) with these green cotton socks, which are decorated with avocado halves. Adorably cute, this little Stormtrooper may look like a toy but in reality, it’s a mini portable charger. Stick this in your pocket or purse and whenever you need some extra juice in your phone, pull it out and it’ll give you some charge to keep you going until you get home. This leather keyring would make a perfect gift for teens. As well as looking really stylish, it can be used as a headphone wrap to keep their favorite pair from tangling. And because it attaches to their keys, they’ll never be without it. A good pair of headphones shouldn’t be hidden away when they’re not in use, nor should they just be placed on a table so their cord can get tangled. This headphone stand is the perfect solution, it fits all over-ear headphones and has a rubberized grip so you can be sure they’re safe. Everyone needs a good blanket when they go camping or traveling. As well as being warm to snuggle under if the nights get cold, you’ll also have a guaranteed dry spot to sit, no matter the weather. This rollable blanket comes with a leather carry strap, perfect to add to your camping gear. If your teen needs help with their astronomy, make it fun with this Clever Catch ball. They have to throw the ball around and whoever catches it has to call out the answer to the question under their left thumb. Learning can be fun, it doesn’t have to be dull. Money trees are fictional, right, a way for us to fantasize about making all our financial worries disappear? Well you can now make one using this tutorial from Sotipical. It’s super easy to make and whoever you gift it to will be grateful for receiving a taste of imagination. Are you struggling with thinking of a decent graduation present? If you don’t want to buy the usual store-bought stuff, this graduation wreath is an amazing gift. Fill it with paper money, gift cards and anything else you like, it’ll be their favorite present. Leis are super cute accessories, especially for students on their graduation. Follow this picture tutorial and you’ll be able to make paper money ones for you to adorn your teen with as they graduate. Not only will they appreciate the money, they’ll love that it’s different to the usual ones.